Well, the long school summer holiday is in full swing now, and, like many mums, from the start I had a list of things we could do together to alleviate too many complaints, plus a healthy dose of boredom in there too of course. I won’t start the “in my day….” conversation, but you know what I mean! Just before the holidays started I ‘hatched’ a little plan of product testing at its best. I thought it would be wonderful for my children to experience the metamorphosis of a caterpillar into a butterfly first hand. So, we opened up our Butterfly Garden to see what this entailed. The kids seemed happy to play with the pop-up mesh habitat we found in the box, while I quickly entered our code into the manufacturer’s website to order our caterpillars! A few days later a little box was delivered, and inside was a little pot, with five of the tiniest caterpillars I have ever seen inside. I was a bit worried at first because they barely moved, and got very excited when I saw one having a munch of the strange food that is deposited in the bottom of the pot. We put the pot on a shelf high enough to deter curious hands, but low enough that everyone could see inside, and waited. 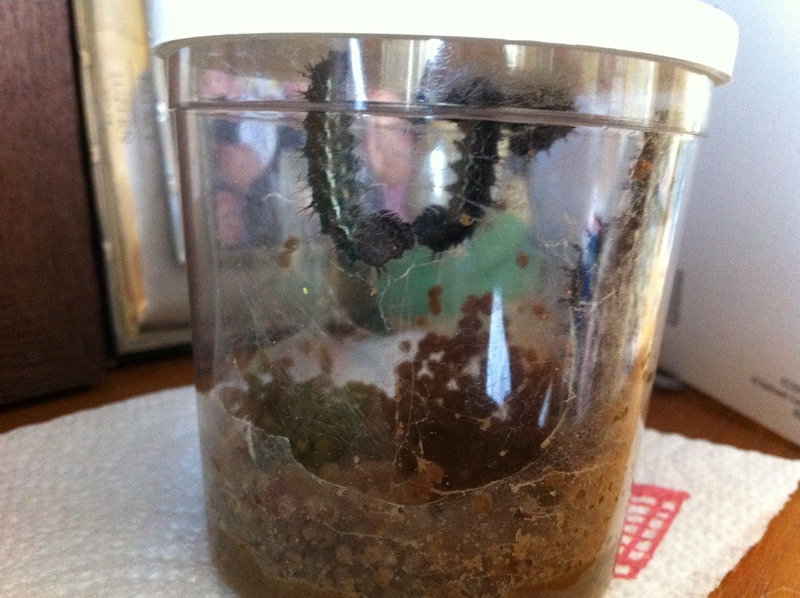 After only one week the caterpillars were much more lively and much bigger. Lots of scoffing was going on now and they grew…and grew and grew! A couple of them seemed to be dropping fluffy poo, but it looked a lot like their own body parts, and I think it probably was, as they quickly got much larger and started to move up to the lid of the pot. 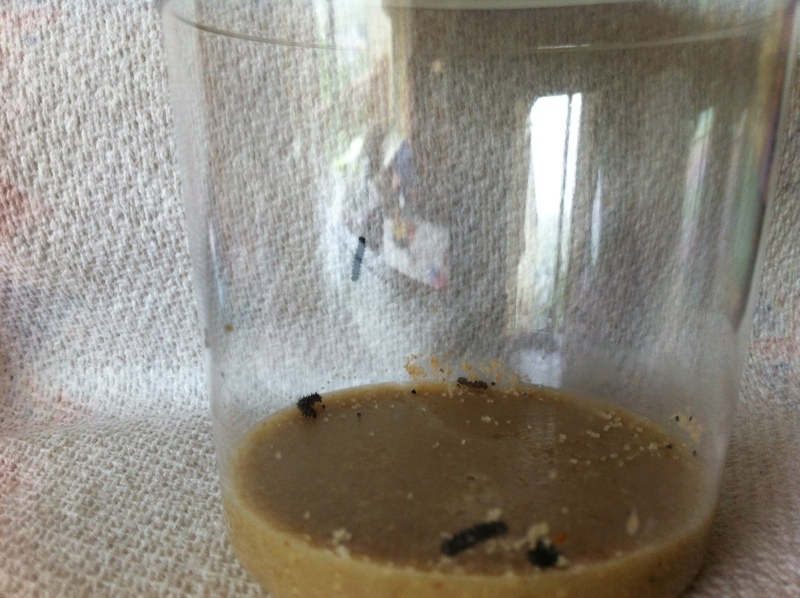 Under the lid, at the top of the pot, is a thin piece of paper which the caterpillars started to hang from. 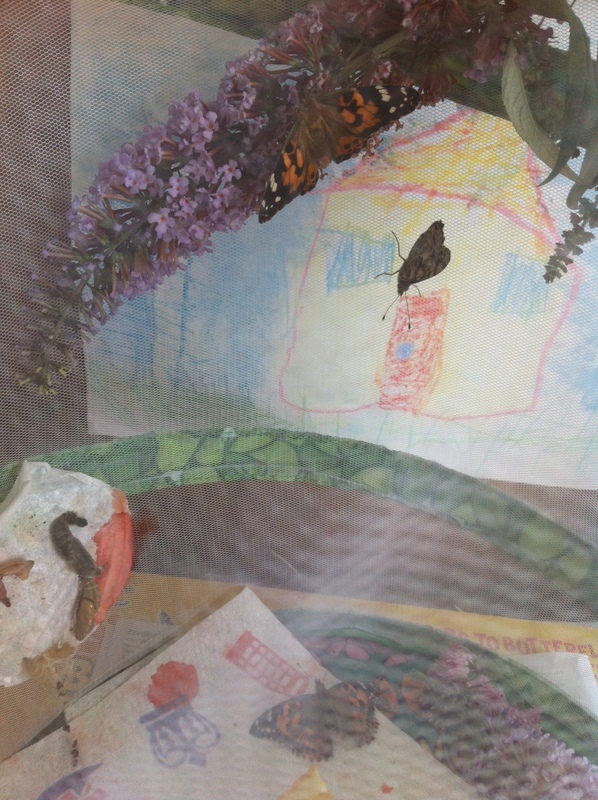 I noticed the first couple hanging there and thought “This is it!” The kids were absolutely enthralled at this point, checking every day for changes, as gradually, all five caterpillars hung upside down and made themselves a chrysalis. We managed to see one actually in progress too. Lot of effort & wriggling ensued, and by the next day the crazy, beautiful, alien-looking chrysalides were all hanging there. Now, following the instructions carefully, I transferred the paper to the mesh habitat and attached it near the bottom so that any fallers wouldn’t have far to go. We had one on the floor of the pot already, which I placed on kitchen towel at the bottom of the habitat. Now, for the wait! Every day we checked, and I believe it was about 10 days before the first one came out. This prompted HUGE excitement in our house, and the first of many arguments about the name of our new, beautiful butterfly. 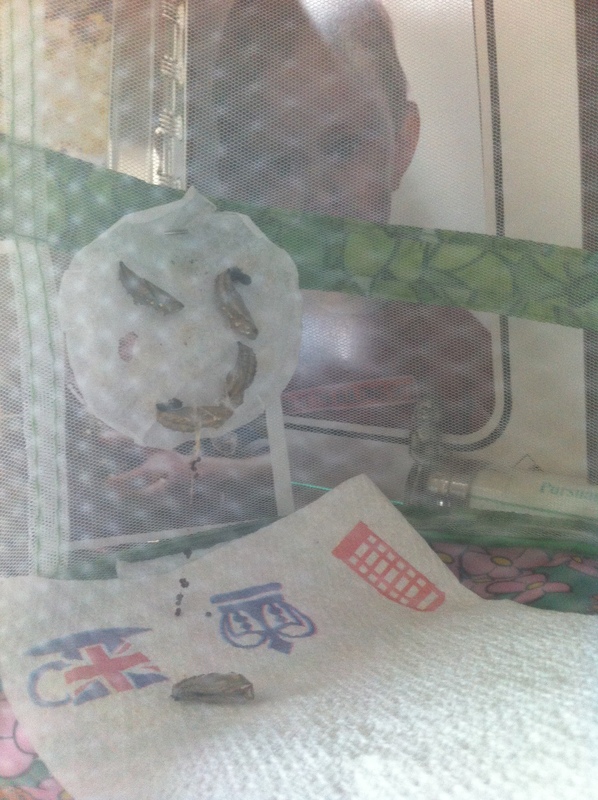 When they are new, the butterflies drop a red liquid, which is called meconium, yes, like babies and their black poo! For the butterflies this is left over after the formation of the wings. It did make their habitat look a little gruesome, like there was blood all over the place, but I guess it’s all part of the experience. 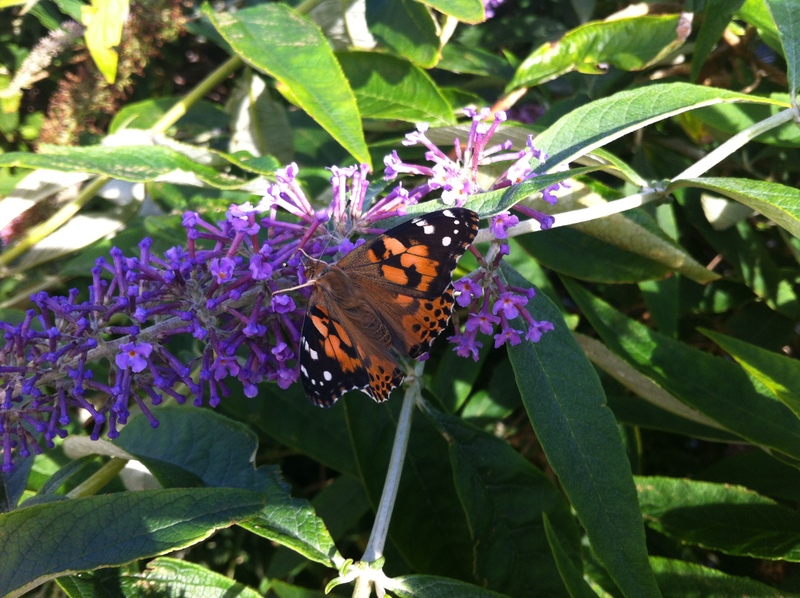 As they emerged, one by one, we decorated the habitat with buddleia, and gave them a juicy piece of orange each day. It was fascinating watching them sip at the orange too! The very best moment was setting them free though. The older, and I guess more confident ones, flew right up and away without a backward glance ;0) One or two had to be coaxed though. 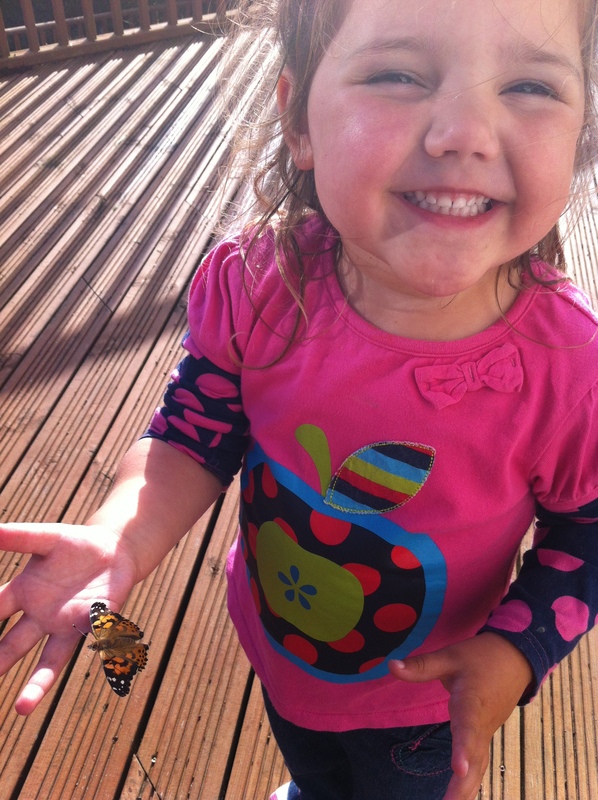 One was so sweet, and sat on the childrens’ fingers calmly for ages, before we put him on the buddleia. This was just a magical experience and one which we are sure to repeat!